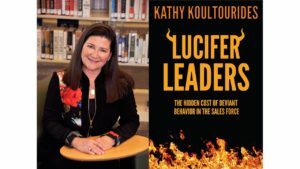 Lucifer Leaders: The Hidden Cost of Deviant Behavior in the Sales Force shines a light on a particular type of sales person who has the capability to derail an organization by inciting other people on the team to engage in illicit behavior. Real workplace horror stories are used throughout the book to build a case for the determinants that can identify this menace, so it can be eliminated from the workplace, or never hired in the first place. To order your copy follow this link. Cathy has been my writing coach since 2015 and I wouldn’t trade her for anything! What I most love about her is her Socratic approach to coaching; she is an expert. Whenever I feel stuck, a quick 30-minute call with Cathy always helps me see the forest through the trees. She has a wonderful ability to tease out different perspectives and hone in on meaningful focus. I will never regret my investment in Cathy; she has been invaluable on my journey to becoming a published author. She has taught me so much and has provided so many useful tools! Cathy is a treasure that truly cares about her clients, and I strongly recommend her to anyone who has aspirations of becoming an author! She is AWESOME!! !